A comically expressive tot pays tribute to the all-important BLANKIE in a bright, playful board book sure to have instant toddler appeal. Anyone who's spent time with a toddler knows that few crises compare with the (even temporary) loss of a favorite blankie. Here, in her humorous, bold graphic style, Leslie Patricelli plays up this scenario, surely near and dear to every toddler's heart. BLANKIE is an affectionate ode to that special object that comforts many a child through the dramas of each day. This offers a warm, comforting view of a toddler's daily world. The message: Even the smallest comforts have the power to make the very young feel safe and secure. Leslie Patricelli made her board-book debut with the winsome BIG LITTLE, QUIET LOUD and YUMMY YUCKY. 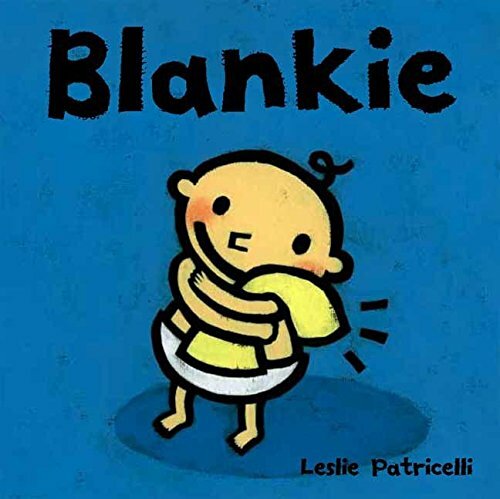 BLANKIE and its companion book BINKY make up what the author calls her "attachment series." BLANKIE, she says, "was created as an ode to that beloved item. I wrote it when my son was nearing three, and the narrative voice of the baby reflects that of my son at this age."